Yup, they're vegan - just like everything else we post. And, they're amazing! I wish I'd made these as a kid! 1. Make the tart dough by combining the flour, salt and nutmeg, and cutting in the butter until it resemembles course sand. Add ice cold water, 2 Tbsp at atime and mix with a spoon or mixer on low until combine. Add more water as needed, you want a DRY dough. Too moist add more flour. 2. Roll out your dough on a heavily floured surface to 1/4 inch thick. Use a pizza slicer to to into 4 inch rectangles. 3. Pre-heat oven to 350 F.
4. Place a thin layer cookie dough on every other dough rectangle. Fold the free rectangles on top of the ones with dough and seal with a fork along the sides. Then cut of the ugly extra bits with your pizza slicer or knife so they look clean and pretty. 5. Bake on a sheet tray for about 30 min (crust will be a light golden brown). Let cool completely. 6. 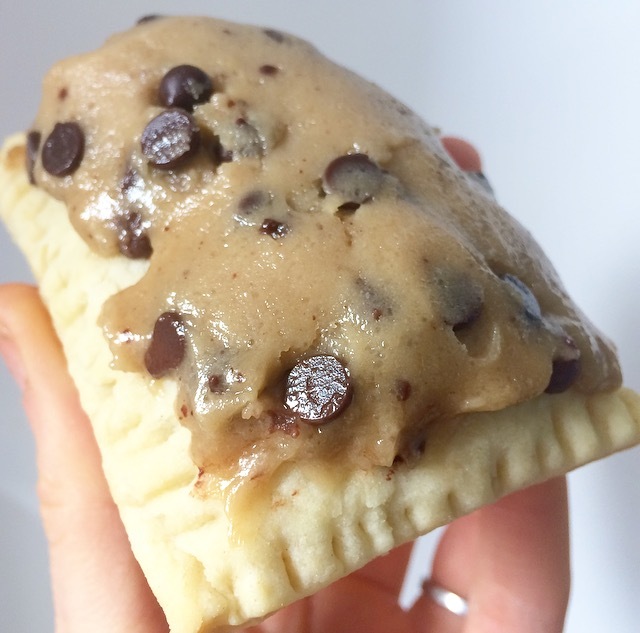 Coat with another layer of cookie dough and serve em up!